The No. 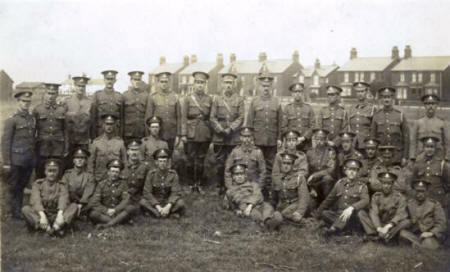 1 Platoon of the St. Annes Corps of the N.M.V. have been hard at practical work this week, and since last Saturday have been assisting the recruiting efforts made in the Fylde district. On Monday last the St. Annes Corps turned out and assembled in the Square, some 20 cars being the average for three successive days. On Tuesday the N.M.V. cars conveyed Lord Derby's band to the outlying districts, some proceeding to Kirkham, Woodplumpton, Broughton, Brock, Treales to Lytham, and others taking the bandsmen to Longridge, Freckleton, Poulton, etc. On Wednesday similar districts were worked. The members were cordially thanked by the recruiting officers for the service. To those ladies and gentlemen who lent their cars to the N.M.V. Corps, the secretary tenders best thanks. Soldiers of the Royal Field Artillery in fields off Headroomgate Road, June, 1915 (Houses in the background are on Highbury Road).